Here's another layout I just finished. I used Misty Cato's "All About a Boy Age 3-5" for this page. 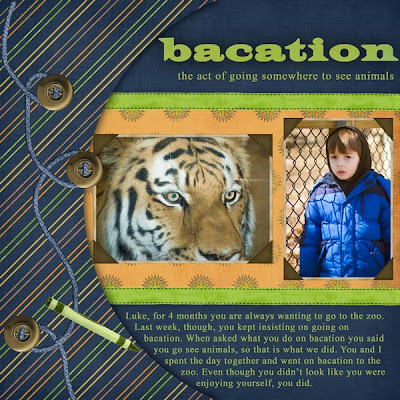 The journaling reads, "Luke, for 4 months you are always wanting to go to the zoo. Last week, though, you kept insisting on going on bacation. When asked what you do on bacation you said you go see animals, so that is what wwe did. You and I spent the day together and went on bacation to the zoo. Even though you didn't look like you were enjoying yourself, you did.